What an absolutely fantastic family home! This well presented, spacious and much loved two/three bedroom semi-detached dormer bungalow has a real welcoming feel throughout boasting off road parking and a good sized rear garden, plus three reception rooms, double glazing and electric heating throughout. Set in a favoured location near to the great range of amenities available in both Liscard and Wallasey Village, including frequent public transport services, handy shops, highly regarded local schooling and nearby commuter links. 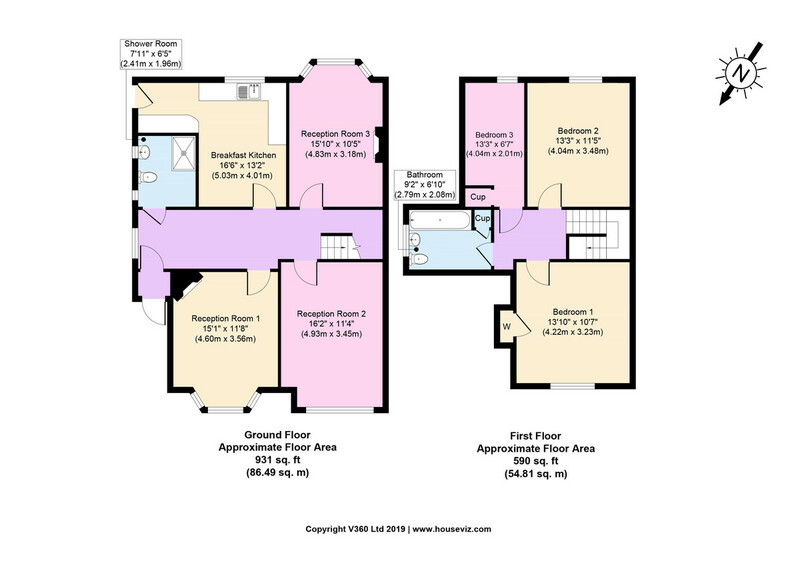 Interior: porch, inviting hallway, wet room, dining room, play room/sitting room, living room and L shaped kitchen on the ground floor. Off the first floor landing there are the three bedrooms and bathroom. Exterior: spacious and sunny rear garden which is ideal for a growing family, pleasant front garden, good sized driveway and detached outhouse/garage. This wonderful family home needs to be viewed to be appreciated in all its glory. WET ROOM 7′ 11″ x 6′ 05″ (2.41m x 1.96m) Two uPVC double glazed frosted windows to side elevation. Wall mounted shower and curtain rail, low level WC and wall mounted hand wash basin. Extractor fan, fully tiled with non-slip flooring. DINING ROOM 15′ 01″ x 11′ 08″ (4.6m x 3.56m) uPVC double glazed bay window to front elevation. Attractive highline original fireplace set within a timber surround with tiled back and hearth. Picture rail and electric heater. PLAY ROOM/SITTING ROOM 16′ 02″ x 11′ 04″ (4.93m x 3.45m) Large uPVC double glazed window to front elevation flooding in plenty of natural light. Electric heater and laminate flooring. LIVING ROOM 15′ 10″ x 10′ 05″ (4.83m x 3.18m) uPVC double glazed bay window overlooking the rear garden. Picture rail, coved ceiling and television point. Off the alcove is the log burner sitting proud on a tiled hearth. Electric heater. L SHAPED KITCHEN 16′ 06″ x 13′ 02″ (5.03m x 4.01m) L shaped breakfast kitchen having a matching range of white base and wall units with contrasting work surfaces over. Stainless steel sink and drainer sitting below the uPVC double glazed window to rear elevation. Space for cooker. Under counter space and plumbing for a washing machine. The room continues into the L shape past some space for a fridge freezer, there is a further base unit with contrasting work surface offering space below for a tumble dryer. Electric wall heater, tiled splash backs and part glazed side door leading out into the garden. BEDROOM ONE 13′ 10″ x 10′ 07″ (4.22m x 3.23m) uPVC double glazed oriel bay window to front elevation with electric heater below. Picture rail, coved ceiling and large storage cupboard. BEDROOM TWO 13′ 03″ x 11′ 05″ (4.04m x 3.48m) uPVC double glazed oriel bay window to rear elevation with electric heater below. Picture rail. Connecting door to the third bedroom. BEDROOM THREE 13′ 05″ x 6′ 07″ (4.09m x 2.01m) Storage area then a step down into the bedroom itself; it would also make a great dressing room or nursery. Circular double glazed window to rear elevation. Electric heater and storage cupboard in the eaves. BATHROOM 9′ 02″ x 6′ 10″ (2.79m x 2.08m) White three piece suite comprising panel bath, low level WC and pedestal wash basin. Storage cupboard housing the hot water tank. uPVC double glazed frosted window to side elevation. Wall heater, part tiled walls and vinyl flooring. REAR EXTERIOR A good sized rear garden which is perfect for a growing family having a patio area ideal for some garden furniture to enjoy alfresco dining over the summer months. Outside playhouse ideal for the children. Further lawned area, boundary fencing and side access gate. Access to the detached outhouse/garage which is ideal for storage. FRONT EXTERIOR Pleasant front approach set behind an original stone wall having a front lawn to the side with established trees and planting. Good sized driveway providing off road parking for two/three cars. Double gates providing access to the rear. LOCATION St Hilary Drive can be found off Claremount Road, approx. 0.4 miles driving distance from our Liscard office.